Switch between high, mid and low pulley exercises quickly and easily with the G3S no cable change design. 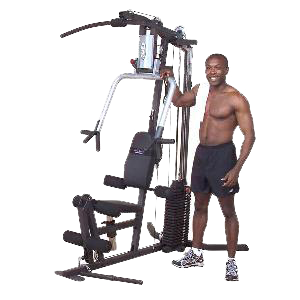 Perform lat pull downs, triceps press downs, biceps curls, resistance abdominal crunches and dozens more exercises with the included cable attachments. The Leg Extension / Leg Curl Station is fully adjustable to comfortably fit any size user and features thick foam rollers for maximum comfort. Add the optional Leg Press / Calf Raise station for the ultimate lower body workout with up to 420 lbs. of resistance.